Brown Spts usually develop on the face and those areas of the body which are exposed to direct sunlight most. Brown spots are flat, brown, gray, or black spots on the skin. They usually occur on sun-exposed areas of the skin. Brown spots are also called liver spots, solar lentigines, or sun spots. 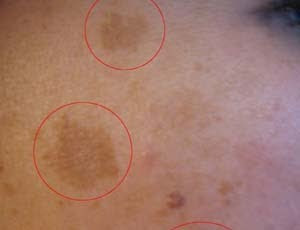 Brown spots are th e result of an excess production of melanin, or skin pigment. 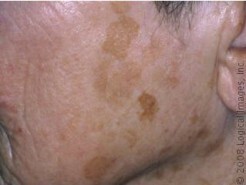 It is not very clear the specific reason for Brown spot to develop, however they normally form on the forehead, face, neck , hands, shoulders , upper back, arms, legs and generally on those parts of the body exposed to direct sunlight (including artificial tanning lights) over an extended period of time. Skin ageing, sun exposure, or other forms of ultraviolet (UV) light exposure, such as tanning beds, all increase the likelihood of sun spots formation over time. Now that we know what causes brown spots, the difference between brown spots and age spots can be explained very easily. The pigments that form the brown spots are usually very superficial. They reside on the upper part of your skin, “the epidermis”. If left untreated this over production of melanin saturates the epidermis and the overproducing melanocytes produce enough melanin and start filling the dermis. Therefore, if left untreated the over-pigmentation will spread to the deeper part of the dermis. In the majority of age spots the melanin is deeply rooted into the dermis therefore making it more difficult to remove them. So to summarise the main difference between brown spots and age spots is where the pigments reside. In brown spots the pigments are confines to the epidermis making their removal very easy. In case of age spots the pigments may have spread to the dermis and in certain cases involving also the hypodermis. People (of kin type 1, 2 and 3) can develop Brown Spots at any age. However, brown spots are more common in people with certain risk factors. None! 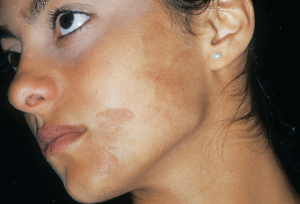 Brown Spots are completely harmless to your health. They are neither painful nor itchy. They can be left untreated and they are removed for aesthetic reasons only. However, if left untreated, brown spots will tend to worsen over time. They will continue the production of melanin which will also extend to the upper dermis, subsequently the dermis and even the deeper parts of the dermis. When the dermis becomes affected by the over production of pigmentation, the removal of the Brown spots (then already Age spots) becomes more difficult even with the use of lasers, electrical arcing and other methods (including exfoliants). Age spots, which are rooted deeper inside the dermis, may require several treatments to be removed. Your doctor will usually diagnose brown spots by simply looking at your skin. If your doctor is suspects that a dark area isn’t a brown spot, a biopsy may be performed. They will remove a small piece of the skin and and sent it to the lab for a histological examination. Yes! Brown spots are very easily removed. This is because their pigments are very superficial. If using professional treatments they are usually removed within one session/treatment. In case you want to use home treatments they can be removed equally easily with the appropriate exfoliants, and they are removed after a number of home treatments. Brown spots aren’t dangerous and don’t cause any health problems. Treatment isn’t necessary. However, some people want to remove them because they feel they are unsightly. Some treatment includes Prescription Medications (especially in the US and Canada). 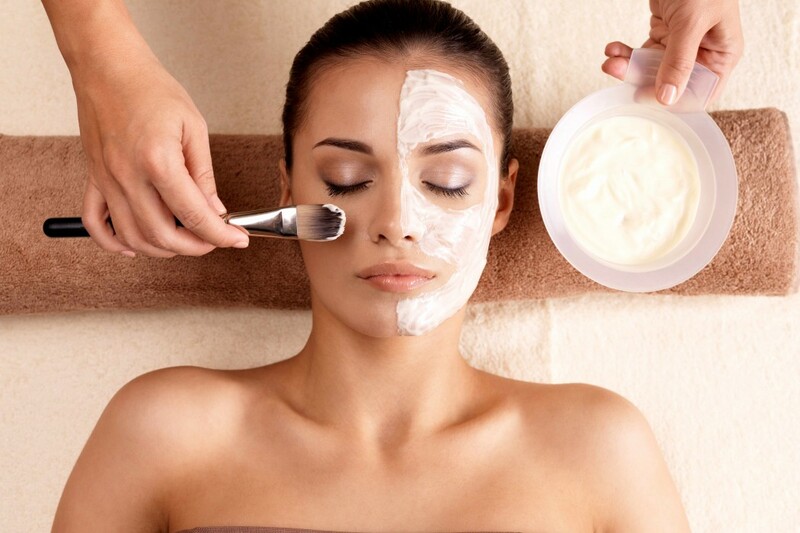 Your doctor may prescribe bleaching creams to fade the age spots gradually. These usually contain hydroquinone (currently banned in Europe), with or without retinoids such as tretinoin. Bleaching creams may require a number of applications and it may take a while for the brown spots to fade. During this type of treatment, you will need to wear sunscreen at all times. Bleaching and tretinoin creams make your skin more sensitive to UV damage. laser resurfacing to destroy the hyper-pigmented area which forms the brown spot. Micro dermal abrasion is a very good option in many cases of brown spots. Micro dermabrasion works by sanding off the upper part of your skin where the pigments of the brown spots normally reside. By using this technique you can see almost instant results. Special chemical peels to ablate (burn) the outer layer of your skin, will allow new skin to grow in place of the brown spot/s. Cosmetic professional peels can be very effective in removing your brown spots. Voltaic Plasma skin resurfacing brings about immediate results. 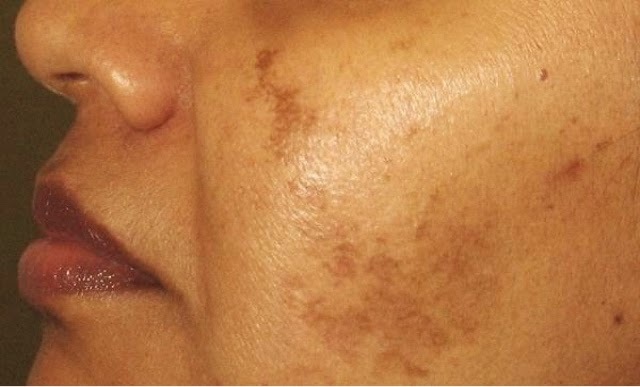 Also Cryotherapy can be used very successfully to remove your brown spots. Please note that despite the method used sometimes a number of treatments may be required to achieve satisfactory results. Remember to always wear sunscreen after any treatment for brown spot removal to protect your healing skin from UV damage. Remember that it was the UV damage that caused the brown spot in the first place. All the professional treatments to remove brown-spots are very effective, however they can be quite costly. As mentioned, one of the treatments to remove brown spots is the use of cosmetic peels or exfoliants. Therefore the use of the appropriate home based peeling products can eventually remove the brown spots completely bringing about the same results you would have otherwise obtained professionally. There are many product marketed for the treatment of brown spots and the majority of them contain AHAs (Alpha Hydroxy Acids) the main active ingredients of exfoliants. Normally these home based products are not as strong as the professional alternatives, however most of them are very effective in the complete removal of the Brown spots. The main difference is that with these types of products a single application is not generally sufficient to remove the brown spots completely. Normally, you will be able to achieve the desired results after a number of applications. NO. Hydroquinone and other skin bleaching substances are not needed in order to remove brown spots. These bleaching substances can help have a brighter skin complexion, however they are not necessary to remove your brown spots. Although skin bleaching products (including hydroquinone) are used legally in most parts of the US and most of the world, some bleaching substances especially hydroquinone have been banned in cosmetic products in Europe. It is not possible to avoid recurrence of brown spots, however avoiding direct sun exposure for long period of time, especially between 10 a.m. and 3 p.m., when the sun’s rays are most intense decrease the likelihood of recurrence dramatically. In case direct sun exposure is unavoidable always wear a sunscreen every day. It should have a sun protection factor (SPF) rating of at least 15 and contain both UVA and UVB protection. Apply sunscreen at least 30 minutes before sun exposure. Reapply every two hours, more often if swimming or perspiring. Wear protective clothing such as hats, pants, and long-sleeved shirts. These help protect your skin from UV rays. For the best protection, wear UV-blocking clothes with an ultraviolet protection factor (UPF) of at least 40 or 50. Remember that these measures cannot avoid the recurrence of brown spots altogether however they dramatically decrease the likelihood to recur.